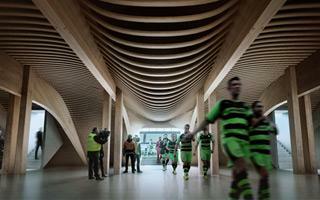 They may be a 5th league club and working on a 5,000-capacity stadium (with expansion to 10,000 planned), but the design competition launched by Forest Green Rovers (FGR) drew worldwide attention and almost 50 entries from some of the best architectural practices. The goal was to design a modern stadium with as many ecologic components as possible, setting new high in sustainability and becoming a landmark locally. That’s ambitious indeed, but if it got the attention of top architects, it may have already been worth it. First FGR shortlisted 9 concepts and then selected two finalists this spring. Today they announced the winner: Zaha Hadid Architects (ZHA). Though Hadid herself didn’t live to see the victory, she did work on this project in her last months. Outcome of the team’s work is truly amazing, as proven by updated renderings presented just minutes ago. As is typical for Hadid’s design, the outer form seems organic, closer to nature’s than humans’ design. The stadium almost seems crawling with its rhythmic wooden skeleton. What changed since the initial concept revealed earlier this year? The seating bowl is now a continuous circuit rather than having empty room for expansion on both ends. Further 5,000 seats would now be added onto the existing stands at a later date (primarily along the sides) with almost no additional construction efforts. What’s not changing is the wide use of wood in the stadium’s structure. Sure, one cannot avoid concrete and steel with a building of this volume, but the entire roof, facades, spectator concourse and even player tunnel will be dominated by wooden elements. Forest Green Rovers will now commission detailed documentation of the stadium. When ZHA supply it, planning application is expected, though no specific time frame was presented. The stadium will become the heart of Eco Park, an exemplary green sports complex spreading across 40 hectares and worth some £100 million (currently some $124 million).